WHAT DOES THE DIFFERENCE BLEND MODE DO? This week I thought I would do a short post on an effect that has always dumb-founded me, but often gives some great results – the Difference Blend Mode. 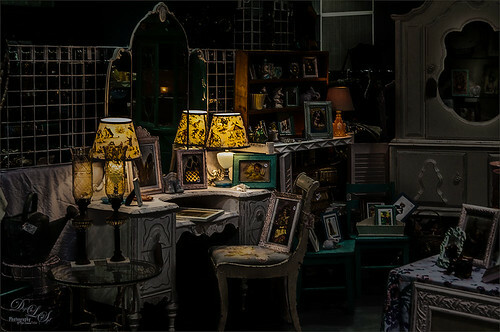 The image above was taken during the day at the Deland Antiques Show. 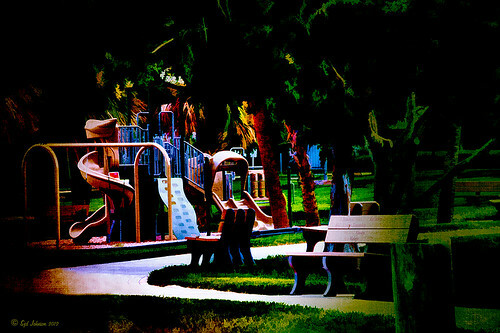 A duplicate layer above the background layer, where in this case Topaz (for website see sidebar in my Tidbits Blog) Detail 3 was used to sharpen the image, was set to Difference and the “FILL” slider was set to 64% and Layer Opacity to 100%. If the Layer Opacity slider was set to 64% and Fill slider to 100%, a totally different effect would occur. This is one of the blend modes that show different effects when adjusting the Layer Opacity and Fill sliders. (The others are Color Burn, Linear Burn, Color Dodge, Linear Dodge-Add, Vivid Light, Linear Light, and Hard Mix.) Another effect was added to this layer by opening the Layer Style dialog (double click on layer in Layers Panel) and the Blend If This Layer white tab was set to 71/181 (to split tab, click on tab and press ALT+drag). (See my How to Get Blend If Slider Settings to Apply to a Layer blog for more info on this.) Three Camera Raw Radial Filters were added to highlight both the desk area even more and the mirror on the left. I was totally surprised with the results, but it shows what you can get with a little experimentation. What the Difference Blend Mode is really doing is a little hard to understand. Sue Chastain has the best explanation for what the blend mode is doing in a link called The Difference Blending Mode. She says “…the Difference blending mode highlights the differences between the blend layer and the base layer. The more technical explanation is that the blend color is subtracted from the base color–or vice-versa, depending on the brightness–and the result is the difference between them. When white is the blend color, the base image is inverted. When black is the blend color, there is no change.” I guess that is why the images all appear a little dark in tone. Here is another very good link on how all the blend modes work called Photoshop Blend Modes Explained for more info on all of them. Another good example of using the Difference blend mode is on an image I have presented before, but it is worth showing again so you can see a little different way to use the blend mode. A Hue/Saturation Adjustment Layer was clipped to a texture set to Vivid Light blend mode. The Adjustment Layer was set to set to a Difference blend mode at 71% Layer opacity and 85% Fill. The Hue/Saturation Adjustment Layer can create some different results especially by changing the Hue slider, which is what was done in this case. Still get that spooky feeling in this image. For more on the original settings used in this image, see my blog My Version of Photoshop Tennis! If you notice a strange color shift in your image when trying to create a stamped layer on top or are merging down a layer, this usually occurs when there are several layers using different blend modes, often including the Difference blend mode. One way to fix this is to change your image to 8-bit mode before creating the stamped layer. Another way is to Create a New Layer in the Layers Panel directly below your Difference blend mode layer (or any layer you are having a problem using) – then CTRL+E to merge the layer down. This keeps the color intact but any attached layer masks will be lost. This entry was posted on 03/15/2014 by sydspix. It was filed under Photoshop and was tagged with Blend Mode Color Shifts, Blend Modes, Difference Blend Mode.